This beautiful tree of life tapestry shows the magnificent Tree of Life based on the design by William Morris, woven in Belgium. The immortal tree of life has been a symbol in many cultures and spiritual beliefs. Representing the connection between heaven and earth, the roots of the tree reach deep into the earth, while its branches reach toward heaven. In between, the branches of this tree provides for a rich life for its viewers who see its many leaves and flowers, as well as the birds who enjoy its branches for their shelter and home. This magnificent work, originally designed by William Morris, shows its rich and sophisticated color palette of the blue green leaves and foliage of the tree with the abundant apricot flowers amongst its branches. There are numerous birds in this particular design, peeping through, with their brown and red plumage. The forest floor is also abundant with flowers. A gorgeous border with acanthus leaves and red flowers completes this beautiful work. 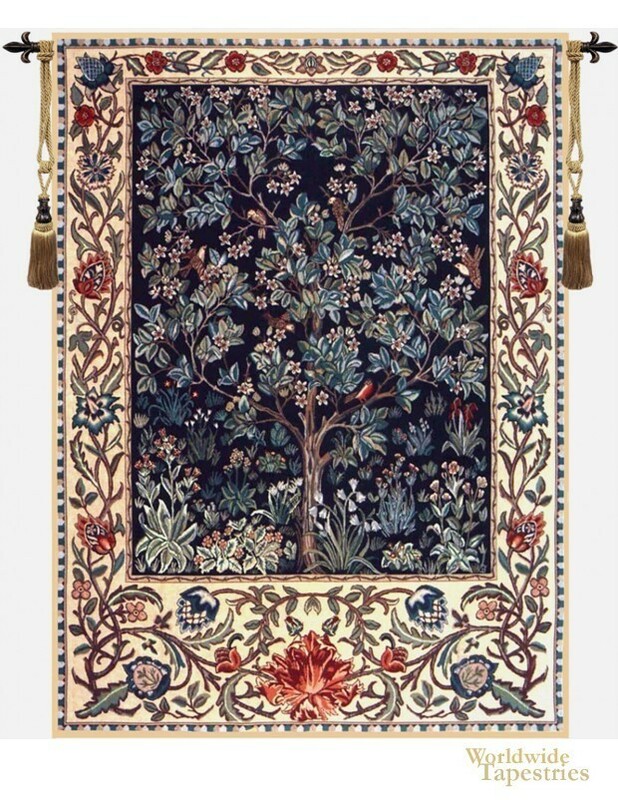 This tapestry "William Morris Tree Of Life" is backed with lining and tunnel for easy hanging. Note: tapestry rod and tassels, if pictured, are not included in the price. Dimensions: W 21" x H 29"
Dimensions: W 33" x H 44"
Dimensions: W 42" x H 56"
Dimensions: W 51" x H 69"
Dimensions: W 69" x H 92"